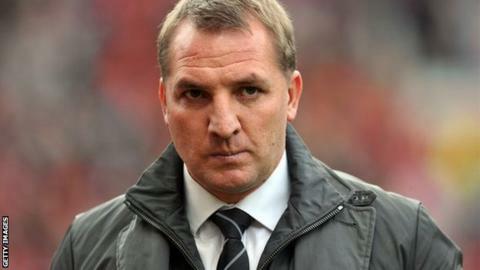 Swansea's Brendan Rodgers has turned down the chance to speak with Liverpool about their vacant managerial position. Kenny Dalglish was sacked as Reds manager on Wednesday, leaving the club looking for a fourth boss in two years. A Swansea statement said: "The club is pleased to confirm that Brendan has declined the opportunity to speak about the vacant position." Wigan manager Roberto Martinez has been given permission by his club to enter into talks with the Anfield club. Is Martinez the man for Liverpool? "Liverpool rang us and asked for permission to speak to Roberto, which I've given," Latics owner Dave Whelan told BBC Sport. The Anfield hierarchy are approaching a number of candidates but former Watford and Reading boss Rodgers, 39, is now out of the picture. In February, the Northern Irishman, who made his name as a coach with the youth team and reserves at Chelsea, was among those touted as possible replacements for Harry Redknapp at Tottenham if the Spurs boss were handed the England job. At the time, he said: "If speculation comes with me doing the job well then I am flattered and honoured. However, this is the place I want to be, hopefully I can be here for the duration of my contract." Whelan said he hoped Martinez would choose to stay at the DW Stadium, but that he understood the Spaniard's popularity. "I'd love to keep him but if he wants to move to Liverpool I will have to say good luck," he explained. "When Liverpool sacked Kenny Dalglish I thought they would be looking around and they say they want a young, ambitious manager. You can't get one better than Roberto, so I expected them to call. "I think he's wonderful, the best manager I have ever worked with. "I was working with Roberto when I got the message. I told him there and then and asked if he wanted to speak to Liverpool and he said 'yes'. "I've always said a big club will come for him and I will release him immediately." Whelan also called for any decision to be made quickly. Owners Tom Werner and John W Henry are based in the United States, while the Reds are also looking for a director of football, a chief executive and a director of communications. Radio 5 live asked John Barnes if Roberto Martinez could do the job. Steve Clarke, Dalglish's assistant, handed in his resignation out of loyalty to the 61-year-old Scot, but it has been rejected. "It's all up to Liverpool and Roberto now," added Whelan. "If they do a deal I hope it's done quickly because we will have to replace Roberto and it's going to be very difficult." Werner and Henry are keen for the club's new manager to be in place for at least four to five years, but there is no front-runner at this stage. The new boss is likely to get a transfer budget of more than £30m. Intermediaries acting for the club have spoken with Andre Villas-Boas.